Here at EuroLux Antiques, we are excited to announce our support of ETV, South Carolina’s public educational broadcasting network. We have just pledged to sponsor prime time programming for the next year. Here is our sponsorship spot that will begin playing this week! You’ll find it alternating on Saturday and Sunday evenings between 7 pm and 9 pm. This entry was posted in News and tagged Antique Furniture, antiques, Antiques Roadshow, ETV, Rick Steve's Europe on September 30, 2012 by euroluxantiques. Vintage Life: Let there be Light! Now that we’ve redesigned our 1920s bungalow, replaced all the subfloors, built new walls and closets, and added pocket doors and new windows, we’re ready to re-wire the house. Remember the exposed wiring? Inside the walls were the fabric-covered wires originally installed when the house was built. Obviously we needed to re-wire the entire house for safety. We now have a new 200 amp service instead of the original 60 amp box. We have light switches galore throughout the house. Here’s a view of the wiring in the upstairs that runs under the floor. And we have light! We’ve installed can lights in the ceilings in most rooms with dimmer switches. We’ve also installed junction boxes in the middle of the ceilings in most rooms for chandeliers or ceiling fans. But not only did we re-wire the whole house, we actually re-built the electrical connection to the house. I really hated the ugly electrical, cable, and telephone wires that ran from the pole, over the driveway, and attached to the roof of the house. So we asked the city to install a new pole, which you can see below to the right of the old pole. Next we dug a trench from the new pole to the side of the house where we had installed a meter base. We ran conduit and then filled in the trench. The city came out, snaked the new electrical service through the conduit, and then installed a new electric meter. The city building inspector came out to take a look and we passed our first inspection! This entry was posted in Vintage Life: Our 1920s Bungalow and tagged 1920s Bungalow Renovation, rewiring an old house, Vintage Life on September 15, 2012 by euroluxantiques. We’ve changed the flow in our 1920s bungalow renovation, and now we’re changing the doors and windows too. Greg and I love pocket doors, and even though they aren’t original to the house, we’ve decided to add them everywhere. Below is the pocket door that will slide open and closed between the master bedroom and the master bathroom. We are re-using as many of the original doors in the house as we can. The one above still needs to be sanded and repainted, but we used it as a sample to make sure we were putting in the frames correctly. 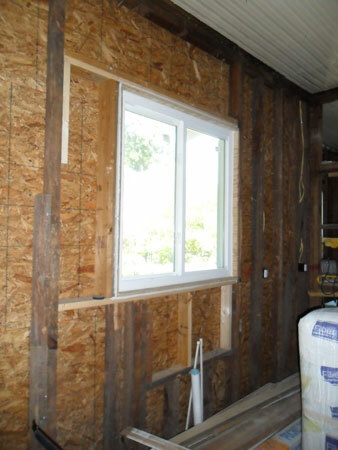 Below is the installed pocket door frame between the laundry room and the master bathroom. 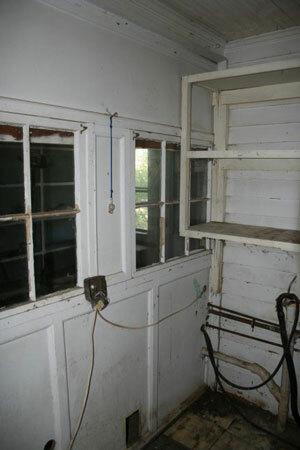 The former owner had already replaced most of the original windows in the house. However, he had purchased the absolute cheapest ones available, and they really didn’t open and close very easily at all. That is how we ended up replacing all of the windows in our little bungalow. We’d come too far to put up with mediocre windows. So even though it wasn’t in our original budget, we now have nice windows that slide up and down and open and close smoothly and easily. I also took the opportunity to make the kitchen window much bigger – it is now 4 feet wide by 4 feet high. 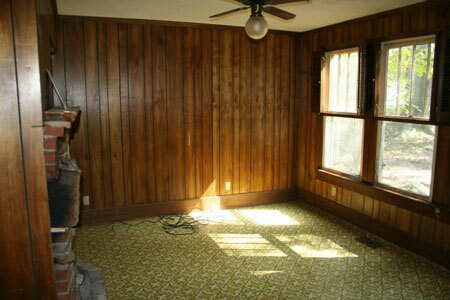 Take a look back at the original dark, ugly family room with paneling, yellow and green patterned linoleum, and old windows. 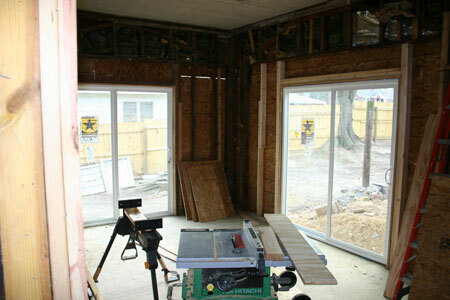 And now check out the sliding glass doors in our sun room – so much more light! There will be a deck off the doors to the left where Greg will grill up delicious food while enjoying a beer. The doors to the right will open onto a screened porch, which I know my cats will enjoy. I’m really looking forward to growing orchids, African violets, and all sorts of houseplants in my sun room! This entry was posted in Vintage Life: Our 1920s Bungalow and tagged 1920s Bungalow Renovation, replacing windows & doors, Vintage Life on September 14, 2012 by euroluxantiques.